TRADITIONAL IOANNIS COTTAGE...Luxurious & Rustic with HEATED Pool !!! Traditional Ioannis Cottage is located in a village called Nerochori which is in the famous area of Apokoronas at Chania city. Just few km from the village of Kalives, Almirida, Georgioupoli, Armenoi and many other villages where you can enjoy perfect beach, tavern and tourist shops. Traditional Ioannis Cottage is provided with the special sign of the Greek Tourist Organization (EOT-1042K91003073201) which secures the quaility level of all services, terms and conditions our guests have the priviledge to enjoy during their stay. 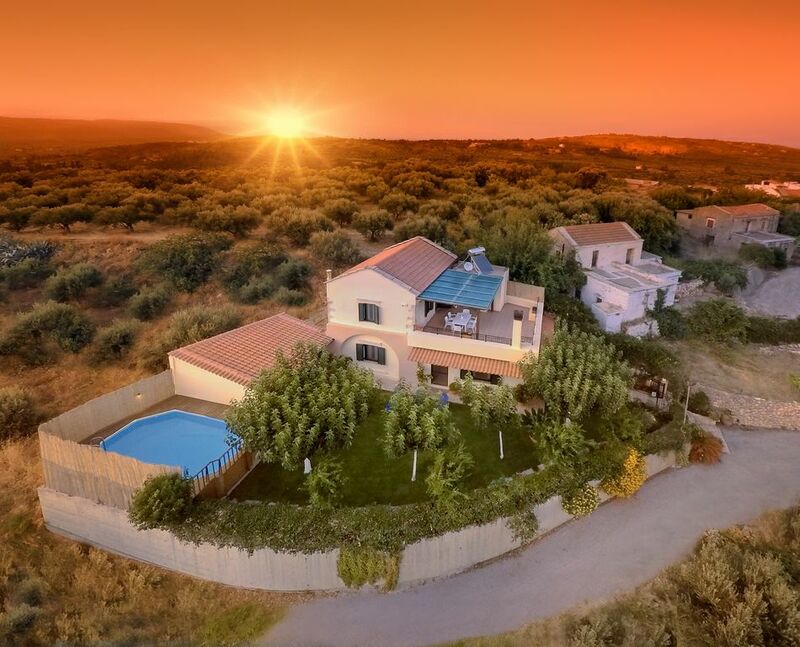 The house (160sqm) is a totally renovated traditional Cretan building with all the modern comforts located at one of the most pure green spots of Crete with big forests, a lot of olive trees and water springs. Live the unique experience to enjoy the view of the Cretan White mountains combined with the green pure nature and other small villages around as you relax by your private Heated pool (20sqm). The big variety of the flowers are creating a colourful romantic private scenery for you to enjoy all day and all night under the stars !!! Explore Crete by visitig places such as Balos, Elafonisi, Falaserna, Samaria Gorge, Preveli, make scuba diving, visit archeological museums and many other spots of the islands with your Free Car (FOR 2 WEEKS OR MORE BOOKINGS) !!! The house is a two level building and it has three bedrooms (2 Double beds - 2 Single beds), two bathrooms (one shower-WC at ground floor & one Bathroomat at 1st floor) one Living room , one kitchen, one relaxing reading room,large veranda at 1st floor, traditional fireplace and a green yard (200sqm) for memorable family holidays you definitely would like to experience !!!. The kitchen has everything you need to prepare any meal or you can just visit one of the many traditional taverns which are very close to the village. Kids small Playroom, HDTV, Satellite TV, DVD-CD player, Free Wi-Fi Internet,Security Alarm, CCTV, child seat, stroller, toys, cots, Books collection will be available to you. The cottage is cleaned up twice a week inside and outside and includes linens and towels. Swimming pool, umbrellas and sun chairs, grassy ground and pool towels also are provided. Wake up the morning and cut your fresh and organic vegetables, fruits and aromatic herbs from your garden and also do your gardening if you wish. The access to the city life is very easy and it is the ideal location for excursions to every corner of the island. Check also the 360 VR Outside & Inside Area Of Traditional Ioannis Cottage !!! 1. Car : We offer to our guests the BEST prices for renting the car they prefer and explore Crete !!! 2. Welcome package full of local organic homemade products for your welcome at the Traditional Ioannis Cottage !!! 3. Special Discounts : Special Discounts are provided for bookings of two or more weeks and for bookings of two persons !!! Send your Requests & enjoy many many surprises !!! Bookings for 2018 are Open - Ask for an Offer and Book the dates you prefer !!! If you want to Experience Greek Hospitality stay at this place. Kids loved the Heated Pool and all amenities of the house. Awesome place to Explore Crete ... We will be back ! What a beautiful traditional villa set in amazing scenery, we were met at the airport by Sifis with our hire car, he led us to the villa where we were met by his mother who’d made us an amazing meal and showed us around the villa. We had all the essentials and more in the fridge, Yiannis had arranged a beautiful cake and decorations for our sons birthday which was on our first full day which was above and beyond what we expected. The villa has everything we needed, the 3 children loved the pool, we had 3 comfortably sized rooms and 2 bathrooms, the villa was cleaned half way through the week and we had another amazing meal! The villa is located about 5-10 mins drive from the main road through crete and only 30-40 mins from chania one way and rethmynon the other. We had such an amazing and relaxing holiday that we’ve booked again for next year. We stayed one week in April. Heated pool was superb. The kids absolutely loved it! The owners were very friendly and helpful. The garden was beautiful and better than in the pictures. Fantastic luxury cottage with a rustic charm. Exceptional is the word that comes to mind!!! The most impressive thing was the hospitality of the hosts. A hire car was very kindly arranged by the hosts. We followed Sifis (the owner) who led us all the way to the property. We were met there by his mother who, to our utter and pleasant surprise had prepared dinner for us. The fridge had all the essentials. We were then given a tour of the property which is in immaculate condition. The kids could not be happier! The cottage is located in the village called Nerochori and the white mountains can be seen from the terrace/verandah. The swimming pool is of decent size, very clean and well maintained. In the middle of the week the house was cleaned and Khara (mother of Sifis) brought us some more food. They also came to meet us with traditional gifts just before we left. During our stay we managed to do quite a bit of sightseeing as well. All in all a very good property, would recommend it to any family. We were deeply touched by the hospitality. 1. Car : We offer to our guests unique prices for renting the car they prefer and explore Crete !!! 2. Welcome package full of local organic homemade products for your welcome at Traditional Ioannis Cottage Cottage !!! 3. Special Discounts : Big Discounts are provided for bookings of two or more weeks and for bookings of two persons !! !